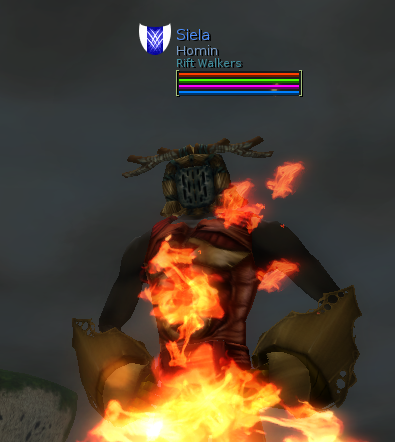 After recieving the Izam from Zarden that they could handle this on their own, Siela decided to go to see the battle from another position for once. Without stress he arrives at the battle place, the battle already having begun. He goes to stand with the rest of the spectators and just enjoys the show. Everything seemed to go well - but all at once he recognizes a coat of arms in a group with some people from Clan de la Sève Noire. He looks again more closely, disbelieving. But indeed, it was the coat of arms of Echoes, a Marauder Clan that was supposed to be part of the alliance. A Marauder Clan he gave quite some Tekorn Mats to. I thought we had a goal. A goal as an Alliance. A goal for the good of Atys. A goal for balance. Something worth fighting for - together. Over the borders of our beliefs. Was I wrong to think that? Was it all an illusion? Or is there still hope? Anyway, I believe that turning on us and what we achieved at the first opportunity, without any announcement of leaving the alliance is unacceptable. All those Tekorn Brambles wandering into the hands of Echoes - and now - enemy hands... It's clear for me that this equals leaving the Alliance and as such stops all delivery or exchange of Outpost Materials from the alliance to them. Also I hope that we can still count on the other Clans in the Alliance - namely Divisum Conditor, Clan des Forces Obscures and ShadoWalkers - or that they will at least have the grace to announce their leaving of it. PS: Great fighting from Les Larmes has kept the Outpost in the hands of the alliance, but my judgement of Echoes actions is not lessened by it - and I hope you will agree. Siela puts the writing in his bag, teleports back to Yrkanis and sends a copy of it to all the Members of the Alliance. A few notes of clarification: Echoes has always been allied with some CSN members first and foremost; which makes perfect sense since this guild was created by Revvy and myself. Therefore when my fellow sisters and brothers request my assistance, I will gladly provide it if I deem it worthwhile, irrespective of anything, anyone, and because that is my individual will. This is a well-known fact. Secondly, Echoes never has, never did, never will, run a tight ship, every guild member is treated as an equal before each other, and there was no discussion in the guild if they would assist in the attack of the Larmes outpost. I announced my intentions, and let everyone else choose their path, the way they saw fit. And that has been my guild's motto since day one, individuality above anything. Thirdly; Echoes have received OP mats from the Allied forces, which is very true, but Echoes also participated in the war, as part of the alliance. Therefore Echoes kept their end until this day. Therefore I am not sure why this is relevant in the discussion. Fourth and most fundamental: Echoes during the "war-frenzy" mode era, participated in almost every single OP war, facilitated about 20 wars in two months, and started their own rebellion; ALONE, way before there were talks of an alliance. What is more, when Echoes held OPs, they got them without the alliance, they in fact got them on their own with help from CSN and some other marauder members. In addition, whenever Echoes declared an OP, only Echoes, CSN and some other marauders where present. Never did Echoes invite anyone not part of the marauder faction to an OP war which we facilitated. That is a fact. On the other hand, on multiple occasions, we were the scapegoats, declared Outposts which we knew were hopeless, standing our ground as much as possible to buy time for the alliance to execute the grander plans; as an attempt to diverge the Kami forces, and to that end, we both delivered, and succeeded. Finally, the announcement to leave the alliance did not occur, because I had began to exhibit symptoms of madness, as the result of my experimentation and adventures with the goo, for quite some time now, and had a plethora of botanists and medics, trying to produce something that could stabilize me. My health finally improved, and today was the first day I ventured outside my humble home; and got an Izam with the news. As it seems, serrae Siela has no patience, nor respect, for a fellow guild leader to announce her intentions to the public, and instead did proceed by sending her Izam to the public in an attempt to paint a misleading picture of myself and my guild. Irrespective of that, and since serrae Siela rushed me to it, I hereby declare that Echoes will not be a part of the alliance, in the sense you define it, anymore. However, as always, if and when there will be a need for a rebellion again, Echoes will strike back and be what it promised to be: a de-stabilizing factor on Atys; and that was the only commitment Echoes ever made. Once he stops laughing he stores the letter in the Guild Hall archives and is glad that everything got cleared in a good manner and not like one of the many worse outcomes he had imagined. * heards a rumor that Northstar does not know how to count over four.